For other uses, see Gandalf (disambiguation). Gandalf /ˈɡændɑːlf/[a] is a fictional character and a protagonist in J. R. R. Tolkien's novels The Hobbit and The Lord of the Rings. He is a wizard, member of the Istari order, as well as leader of the Fellowship of the Ring and the army of the West. In The Lord of the Rings, he is initially known as Gandalf the Grey, but returns from death as Gandalf the White. Although mainly known as Gandalf, the character has a number of names in Tolkien's writings. Gandalf himself says, "Many are my names in many countries. Mithrandir[b] among the Elves, Tharkûn to the Dwarves, Olórin I was in my youth in the West that is forgotten, in the South Incánus, in the North Gandalf; to the East I go not." Tolkien derived the name Gandalf from Norse mythology. In Norse the name means wand-elf or staff-elf. This is reflected in his name Tharkûn, which is "said to mean 'Staff-man' " in Khuzdul, one of Tolkien's invented languages. In Middle-earth the colour of a Wizard's cloak distinguishes him from other Wizards. For most of his manifestation as a wizard, Gandalf's cloak is famously grey, and from this derive a number of his appellations: hence Gandalf the Grey, and Greyhame. Mithrandir is a name in Sindarin (another language invented by Tolkien), the translation of which gives rise to further names for Gandalf: the Grey Pilgrim and the Grey Wanderer. Midway through The Lord of the Rings, Gandalf is promoted to the head of the order of Wizards, and is thus named Gandalf the White instead of Gandalf the Grey. This change in status (and clothing) also introduces yet another name for the wizard: the White Rider. However even after this transformation, characters who speak Elvish still refer to the wizard as Mithrandir. At times in The Lord of the Rings, other characters address Gandalf by nicknames, usually disparaging: hence Stormcrow, Láthspell, and Grey Fool. Láthspell means 'Ill-news' in Old English. The Istari arrived in Middle-earth separately, around T.A. 1000; Gandalf the Grey was the last, landing in the Havens of Mithlond. He seemed the oldest and least in stature of them, but Círdan the Shipwright felt that he had the highest inner greatness on their first meeting in the Havens, and gave him Narya, the Ring of Fire. Saruman, the chief Wizard, later learned of the gift and resented it. Gandalf hid the ring well, and it was not widely known until he left with the other ring-bearers at the end of the Third Age that he, and not Círdan, was the holder of the third of the Elven-rings. Gandalf's relationship with Saruman, the head of their Order, was strained. The Wizards were commanded to aid Men, Elves, and Dwarves, but only through counsel; it was forbidden to use force to dominate them – an injunction that Saruman increasingly disregarded. In Of the Rings of Power and the Third Age (in The Silmarillion) and The Istari (in Unfinished Tales), Tolkien fleshes out the background and the history briefly tabulated by date in Appendix B of The Lord of the Rings. Gandalf suspected early on that the Necromancer of Dol Guldur was not a Nazgûl but Sauron himself. He went to Dol Guldur (in T.A. 2063) to discover the truth, but the Necromancer withdrew before him. The Necromancer returned to Dol Guldur with greater force in T.A. 2460, and the White Council was formed in response (T.A. 2463). Galadriel had hoped Gandalf would lead the Council, but Gandalf refused, declining to be bound by any but the Valar who sent him. Saruman was chosen instead, as being most knowledgeable about Sauron's work in the Second Age. Gandalf returned to Dol Guldur in T.A. 2850 "at great peril" and learned that the Necromancer was indeed Sauron returned. (This is when Gandalf found Thráin II imprisoned in Dol Guldur and recovered Thrór's map and the key to Erebor before Thráin died.) The following year the White Council was summoned, and Gandalf urged that Sauron be driven out. Saruman, however, reassured the Council that Sauron's evident effort to find the One Ring (a necessary component of his resurgence) would fail, as the Ring would long since have been carried by the river Anduin to the Sea; and the matter was allowed to rest. But at this time, Saruman himself began actively seeking the Ring near the Gladden Fields where Isildur had been killed, not far from Dol Guldur. In T.A. 2941, Gandalf arranged (and frequently accompanied) a band of 13 dwarves and the hobbit Bilbo Baggins to reclaim from Smaug the Dwarves' lost treasure in Erebor. To the quest, Gandalf contributed the map and key to Erebor. It was on this Quest of Erebor that Gandalf found his sword, Glamdring, in a troll's treasure hoard. As explained in The Fellowship of the Ring, Gandalf spent the years between The Hobbit and The Lord of the Rings travelling Middle-earth in search of information on Sauron's resurgence and Bilbo's mysterious ring, spurred particularly by Bilbo's initial misleading story of how he had obtained it as a "present" from Gollum. During this period he befriended Aragorn and first became suspicious of Saruman. He spent as much time as he could in the Shire, strengthening his friendship with Bilbo and Frodo, Bilbo's orphaned cousin and adopted heir. He returned to the Shire for Bilbo's "eleventy-first" (111th) birthday party in T.A. 3001, bringing many fireworks for the occasion. After Bilbo, as a prank on his guests, put on the Ring and disappeared, Gandalf strongly encouraged his old friend to leave the Ring to Frodo, as they had planned. Bilbo became hostile and accused Gandalf of trying to steal the Ring—which he called "my precious", much as Gollum had done. (Gandalf later discovered that Isildur, who earlier possessed the ring and was destroyed by it, had written "it is precious to me".) Alarmed, Gandalf impressed on Bilbo the foolishness of this accusation. Coming to his senses, Bilbo admitted that the Ring had been troubling him, and leaving it behind for Frodo, he departed for Rivendell. Though Bilbo would never be entirely free of the desire for the Ring, he was the first of its bearers to give it up willingly. Over the next 17 years, Gandalf travelled extensively, searching for answers on the Ring. He found some answers in Isildur's scroll, in the archives of Minas Tirith. But he also wanted to question Gollum, who had borne the Ring for many years. Gandalf searched long and widely for Gollum, and often had the assistance of Aragorn. Aragorn eventually succeeded. Gandalf questioned Gollum, threatening him with fire when he proved unwilling to speak. Gandalf learned finally that Sauron had forced Gollum under torture in Barad-dûr to tell what he knew of the Ring. This reinforced Gandalf's growing suspicion that Bilbo's ring was the One Ring. The Balrog reached the bridge. Gandalf stood in the middle of the span, leaning on the staff in his left hand, but in his other hand Glamdring gleamed, cold and white. His enemy halted again, facing him, and the shadow about it reached out like two vast wings. It raised the whip, and the thongs whined and cracked. Fire came from its nostrils. But Gandalf stood firm. "You cannot pass," he said. The orcs stood still, and a dead silence fell. "I am a servant of the Secret Fire, wielder of the flame of Anor. You cannot pass. The dark fire will not avail you, flame of Udûn. Go back to the Shadow! You cannot pass." At the Bridge of Khazad-dûm, they encountered "Durin's Bane", a fearsome Balrog from ancient times. Gandalf faced the Balrog to enable the others to escape. After a brief exchange of blows, Gandalf broke the bridge beneath the Balrog with his staff. As the Balrog fell, it wrapped its whip around Gandalf's legs, dragging him over the edge. As his friends looked on in horror, Gandalf fell into the abyss, crying "Fly, you fools!" as he went. After a long fall, Gandalf and the Balrog crashed into a deep subterranean lake in Moria's underworld. Gandalf pursued the Balrog through the tunnels for eight days until they climbed to the peak of Zirakzigil. Here they fought for two days and nights. In the end, the Balrog was defeated and cast down onto the mountainside. Gandalf himself died shortly afterwards, and his body lay on the peak while his spirit travelled "out of thought and time". Gandalf was eventually "sent back"[c] as Gandalf the White, and returned to life on the mountain top. Gwaihir, lord of eagles, carried him to Lórien, where he was healed of his injuries and re-clothed in white robes by Galadriel. He travelled to Fangorn Forest, where he encountered Aragorn, Gimli, and Legolas (who were tracking Merry and Pippin). They mistook him for Saruman, but he stopped their attacks and revealed himself. "This, then, is my counsel," [said Gandalf.] "We have not the Ring. In wisdom or great folly it has been sent away to be destroyed, lest it destroy us. Without it we cannot by force defeat [Sauron's] force. But we must at all costs keep his Eye from his true peril... We must call out his hidden strength, so that he shall empty his land... We must make ourselves the bait, though his jaws should close on us... We must walk open-eyed into that trap, with courage, but small hope for ourselves. For, my lords, it may well prove that we ourselves shall perish utterly in a black battle far from the living lands; so that even if Barad-dûr be thrown down, we shall not live to see a new age. But this, I deem, is our duty." Aragorn and Gandalf then led the final campaign against Sauron's forces at the Black Gate, in an effort to distract the Dark Lord's attention from Frodo and Sam, who were at the same moment scaling Mount Doom to destroy the One Ring. In a parley before the battle, Gandalf and the other leaders of the West met the Mouth of Sauron, who showed them Frodo's mithril shirt and other items from the Hobbits' equipment. But Gandalf rejected Mordor's terms of surrender, and the forces of the West faced the full might of Sauron's armies, until the Ring was destroyed in Mount Doom. Gandalf led the Eagles to rescue Frodo and Sam from the erupting mountain. When writing The Hobbit in the early 1930s Tolkien gave the name Gandalf to the leader of the Dwarves, the character later called Thorin Oakenshield. The name is taken from the same source as all the other Dwarf names (save Balin) in The Hobbit: the "Catalogue of Dwarves" in the Völuspá. The Old Norse name Gandalfr incorporates the words gandr meaning "wand", "staff" or (especially in compounds) "magic" and álfr "elf". The name Gandalf is found in at least one more place in Norse myth, in the semi-historical Heimskringla, which briefly describes Gandalf Alfgeirsson, a legendary Norse king from eastern Norway and rival of Halfdan the Black. 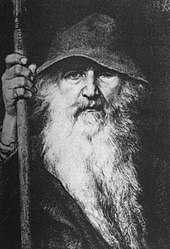 Gandalf is also the name of a Norse sea-king in Ibsen's second play The Burial Mound. The name "Gandolf" occurs as a character in William Morris' 1896 fantasy novel The Well at the World's End. Morris' book is a four-part story set in a pseudo-medieval landscape which is known to have deeply influenced Tolkien. Tolkien came to regret his ad hoc use of Old Norse names, referring to a "rabble of eddaic-named dwarves, ... invented in an idle hour" in 1937. But the decision to use Old Norse names came to have far-reaching consequences in the composition of The Lord of the Rings; in 1942, Tolkien decided that the work was to be a purported translation from the fictional language of Westron, and in the English translation Old Norse names were taken to represent names in the language of Dale. Gandalf, in this setting, is thus a representation in English (anglicised from Old Norse) of the name the dwarves of Dale had given to Olórin in the language they used "externally" in their daily affairs, while Tharkûn is the (untranslated) name, presumably of the same meaning, that the dwarves gave him in their native Khuzdul language. Tolkien explains this in his Guide to the Names in The Lord of the Rings (1967) to prospective translators. John Huston voiced Gandalf in the animated films The Hobbit (1977) and The Return of the King (1980) produced by Rankin/Bass. William Squire voiced Gandalf in the animated film The Lord of the Rings (1978) directed by Ralph Bakshi. Ivan I. Krasko played Gandalf in the Soviet film adaptation The Hobbit (1985) Gandalf was portrayed by Vesa Vierikko in the Finnish television miniseries Hobitit (1993). McKellen received widespread acclaim for his portrayal of Gandalf, particularly in The Fellowship of the Ring, for which he received both a Screen Actors Guild Award and Saturn Award for Best Supporting Actor, and an Academy Award nomination under the same category (making him the only individual cast member of the films to be nominated for an Oscar). In addition, Empire named Gandalf, as portrayed by McKellen, the 30th greatest film character of all time. He later reprised the role in The Hobbit film series (2012–2014), claiming that he enjoyed playing Gandalf the Grey more than Gandalf the White. McKellen has also provided the voice of Gandalf for multiple video games based on the films, including The Two Towers and The Return of the King. Gandalf appears in The Lego Movie voiced by Todd Hanson. He is among the Master Builders that meet in Cloud Cuckoo Land. Vitruvius often mixes him up with Albus Dumbledore, much to the chagrin of the two wizards. Gandalf is also a playable character in The Lego Movie Videogame: in story mode he and a Magician help Emmet fight Lord Business's giant robot by providing his construction mech with debris to throw at it. Gandalf appears in the video game Lego Dimensions and is voiced by Tom Kane (who previously voiced Gandalf in the video game The Fellowship of the Ring). Gandalf is one of the three main characters (with Batman and Wyldstyle) and works with them to rescue the kidnapped Frodo and the One Ring. ^ In Letters, #156, pp 202–3, Tolkien clearly implies that the "Authority" that sent Gandalf back was above the Valar (who are bound by Arda's space and time, while Gandalf went beyond time). He clearly intends this as an example of Eru intervening to change the course of the world. ^ a b Tolkien, J.R.R. (1980). "The Istari". Unfinished Tales. Crows Nest, Australia: George Allen & Unwin. pp. 390–391. ^ Tolkien, J. R. R. (1954). "The White Rider". The Two Towers (2 ed.). Crows Nest, Australia: George Allen & Unwin. p. 279. ISBN 0 04 823046 4. ^ John D. Rateliff (2007), The History of The Hobbit, volume 2 Return to Bag-End, HarperCollins, Appendix III; ISBN 0-00-725066-5. The name Gandalf appears as a dwarf name in the lists in the Völuspá, which Tolkien mentions as a source in Letters (Houghton Mifflin, 2000, letter number 297, p. 383). Rateliff recounts (in Vol 1, Mr. Baggins, p. 15) that Tolkien originally gave the name to Thorin Oakenshield in The Hobbit, but transferred it to the character of the wizard before publication. ^ Tolkien, J. R. R. (1980). "Narn I Hin Hurin". Unfinished Tales. Crows Nest, Australia: George Allen & Unwin. p. 397. ISBN 0-04-823179-7. ^ "Olórin I was in my youth in the West that is forgotten", The Two Towers, "The Window on the West", page 353. ^ Tolkien, J.R.R. (1980). The Silmarillion. Crows Nest, Australia: George Allen & Unwin. pp. 30–31. ^ Tolkien, J.R.R. (1980). "The Istari". Unfinished Tales. Croiws Nest, Australia: George Allen & Unwin. p. 393. ^ a b c d e f g h i The Return of the King, Appendix B. ^ Tolkien, J.R.R. (1954). "14". the Fellowship of the Ring. Crows Nest, Australia: George Allen & Unwin. ^ a b Zimmerman, Manfred (1983). "The Origin of Gandalf and Josef Madlener". Mythlore: A Journal of J.R.R. Tolkien, C.S. Lewis, Charles Williams, and Mythopoeic Literature. Oxford, England: Mythopoeic Society. 9 (4). ^ The Fellowship of the Ring, "Many Meetings". ^ Unfinished Tales, "The Istari", p. 389. ^ Jøn, A. Asbjørn (1997). An investigation of the Teutonic god Óðinn; and a study of his relationship to J. R.R. Tolkien's character, Gandalf (Thesis). University of New England. ^ Burns, Marjorie (2005). Perilous Realms: Celtic and Norse in Tolkien's Middle-earth. Toronto, Ontario, Canada: University of Toronto Press. p. 97. ISBN 0-8020-3806-9. ^ "Halfdan the Black Saga (Ch. 1. Halfdan Fights Gandalf and Sigtryg) in Snorri Sturluson, Heimskringla: A History of the Norse Kings, transl. Samuel Laing (Norroena Society, London, 1907)". mcllibrary.org. Retrieved 22 March 2018. The same autumn he went with an army to Vingulmark against King Gandalf. They had many battles, and sometimes one, sometimes the other gained the victory; but at last they agreed that Halfdan should have half of Vingulmark, as his father Gudrod had had it before. ^ Anderson, Douglas, ed. (1988). "Inside Information". The Annotated Hobbit. Crows Nest, Australia: Allen & Unwin. p. 287. ^ John Rateliff, Mr. Baggins, "Introduction", p. ix (and many other references throughout the book). ^ The Hobbit, "Inside Information". ^ The Return of the Shadow, p. 452. ^ "'The Hobbit': Russian Soviet Version Is Cheap / Delightful". Huffington Post. New York City: Huffington Post Media Group. 21 December 2011. Retrieved 30 September 2012. ^ Saney, Daniel (1 August 2005). "'Idiots' force Connery to quit acting". Digital Spy. London, England: Hearst Magazines UK. Retrieved 2 February 2011. ^ "New York Con Reports, Pictures and Video". TrekMovie. 9 March 2008. Retrieved 12 March 2008. ^ Ryan, Mike (December 6, 2012). "Peter Jackson, 'The Hobbit' Director, On Returning To Middle-Earth & The Polarizing 48 FPS Format". The Huffington Post. New York City: Huffington Post Media Group. Retrieved August 12, 2013. ^ "The 100 Greatest Movie Characters: 30. Gandalf". Empire. London, England: Bauer Media Group. 29 June 2015. Retrieved 9 June 2018. ^ Sibley, Brian (2006). "Ring-Master". Peter Jackson: A Film-maker's Journey. London, England: Harpercollins. pp. 445–519. ISBN 0-00-717558-2. ^ "Ian McKellen as Gandalf in The Hobbit". McKellen. Archived from the original on 3 July 2011. Retrieved 11 January 2011. ^ Jones, Kenneth (25 July 2005). "Precious News! Tony Award Winner Will Play Gandalf in Lord of the Rings Musical; Cast Announced". Playbill. London, England: Playbill, Inc. Retrieved 28 March 2013. ^ Lang, Derrick (9 April 2015). "Awesome! 'Lego Dimensions' combining bricks and franchises". The Denver Post. Denver, Colorado: Digital First Media. Archived from the original on 4 September 2015. Retrieved 9 April 2015.